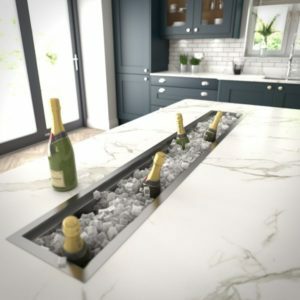 Granite and quartz are still key elements in kitchen design this year, whether you opt for the uniformity and practicality of quartz or go for the stunning designs in natural granite. There are no hard and fast rules about which is better, it’s down to personal taste. You could always mix and match for an eclectic look, dark granite with a contrasting light quartz looks amazing and is very on trend. 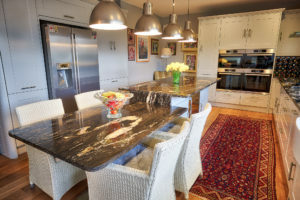 Single slab splash-backs are big news as designers are veering away from tiles and opting for something more dramatic, creating a focal point in the kitchen. They are also highly practical and easy to clean, so why wouldn’t you? Islands are also here to stay, with waterfall worktops of different heights and materials being seen more and more often. The kitchen has always been seen as the centre of the home, and this year it’s no different. Look at ways to make your kitchen multi-use such as big comfy chairs, a farmhouse table or island/peninsula for informal eating. Keep it open plan and spacious. Banquette seating is a popular choice as it combines flexible seating with storage. The natural look is still prominent in 2019, bringing the outside in with the patterns and textures of nature in colours from taupe, cream and stone to plant greens and browns. Adding natural accessories like wicker and wood finishes this look off perfectly. More and more people are opting for undermount sinks as they are stylish and practical. The choice is vast; single, one-and-a-half or double bowl, different sizes, stainless steel, copper, quartz and ceramic. 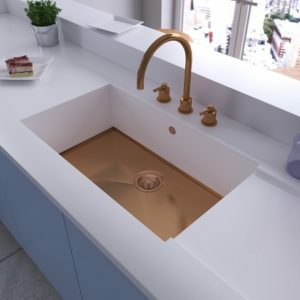 Coloured sinks are rising in popularity and are becoming more readily available. You can even have one that matches your worktop! We supply sinks from The 1810 Company who have one of the biggest and best ranges of sinks and taps in the UK. The latest addition is the accessory trough, in stainless steel and in either 900 or 1200mm length it can be undermounted, flush or inset. Perfect for parties when you need to keep your champagne cold. As well as the range of sinks, The 1810 Company also supply a huge range of taps. The ranges include stainless steel, copper and chrome in square and curved designs. From traditional to modern styles, there’s something to suit every kitchen, including one with a flexible spout with different coloured sleeves! Smart kitchens are the ultimate home addition in 2019, with technology being used to make day to day living easier. Appliances that can be controlled remotely are big news, so if you’re a tech lover this is the perfect trend for you. It’s also ideal for busy people who are looking for efficiency and eco-friendly options. Darker colours are making a comeback in home decor, sophisticated matt black combined with rich coffee, taupe and biscuit is a strong look, with brass or copper coloured accents. Coloured cupboards are set to be big this year, with pastels being top of many peoples wish lists. Make your kitchen a haven of peace and tranquillity with pale coloured units and matching stone worktops. Combined with subtle lighting you’ll have a perfect family chill-out space. Minimalism is one of the years buzzwords, with streamlined spaces, clean lines and long stretches of uncluttered surfaces being the look to go for.